As the holidays quickly approach, Community Missions is gearing up for its third annual #GivingTuesday event – and it’s inviting the Niagara community to catch the giving spirit. Occurring this year on Dec. 1, #GivingTuesday is held annually on the Tuesday after Thanksgiving (in the U.S.) and the widely recognized shopping events “Black Friday,” Small Business Saturday and Cyber Monday. The event inspires people to take collaborative action to improve their local communities, give back in better, smarter ways to the charities and causes they support, and help create a better world. Community Missions has provided the Niagara community with a wide range of vital services since 1925. In 2014, CMI provided more than 76,900 meals and 10,000 nights of care within its crisis services programs. Additional agency programs serve adults and youth with psychiatric disabilities, parolees, at-risk youth and other underserved populations in both residential and recovery-oriented settings. For more information, visit www.CommunityMissions.org. For more information about the event and Community Missions, click here. More than 540 Niagara University alumni, students and friends came together in the name of educational access and affordability during the institution’s 2015 President’s Dinner, held Nov. 13 at the Seneca Niagara Casino Hotel and Event Center. The purpose of the President’s Dinner is to generate funds for scholarship assistance for qualified Niagara University students. During the 2014-15 academic year, 98 percent of undergraduate students received scholarship assistance from the university that totaled more than $41 million. Also celebrated during the event was Niagara University impact on the social and economic development of Western New York, the latter of which is estimated at $227 million annually. Maher, who has made access and affordability to excellent education hallmarks of his presidency, pointed to several critical reasons for Niagara’s ascent to become the region’s largest independent Catholic university. Among them are the high degree of engagement students have with excellent faculty, a 97 percent job and graduate school placement rate within one year of graduation, and Buffalo-Niagara’s highest four-year graduation rate. For more on the event, read here. Recent plans presented to renovate the church/theater on Plain Street in Lewiston have been put on hold. The Sentinel learned Thursday a deal to purchase the 114-year-old building fell through midweek. Members of the Village Board favored the idea of refurbishing and reopening the building at 409 Plain St., which was the original site of St. Peter R.C. Church (circa 1901). Artpark & Company and Niagara University most recently used the venue for theater productions. “I think you’ve got three women who are really going to put their heart and soul into this, and keep a historic building from falling into ruin,” Trustee Vic Eydt said at Monday’s monthly board meeting. Explore & More Children’s Museum announced yesterday that a $1 million capital gift from Delaware North for the “Play It Forward” campaign in sponsorship of the “Being Good Neighbors” educational play zone in the new museum at Canalside, set to open in the second half of 2018. “Being good neighbors, celebrating our diversity and investing in the future of Buffalo’s children are shared missions of both Explore & More and Delaware North. Like our investment in Say Yes, we are happy to be a part of this project that will have such a profound impact on the lives of children and families here for years to come,” said Lou Jacobs, co-CEO of Delaware North, the global hospitality and food service company that was founded 100 years ago in Buffalo and is headquartered there today. The announcement was made at a Culture Day program Explore & More educators facilitated with third-grade students at Waterfront Elementary/Buffalo Public School No. 95. To read more on the story, click here. The Town of Lewiston Town Council voted Monday to place Ron Winkley in the supervisor position until Steve Broderick takes the reins in January. The former Lewiston Police Department chief and Village of Lewiston trustee has served with this board since 2011. Former Supervisor Dennis Brochey resigned last week. He and his wife, Cathy, bought a home in Las Vegas to be near family. Deputy Supervisor Mark Briglio sought Brochey’s position, but lost to Broderick in the recent election. Town of Lewiston election update! Following more than three hours of absentee and affidavit ballot tabulations inside the Niagara County Board of Elections Tuesday, Republican Town of Lewiston Highway Superintendent Doug Janese has taken a four-vote lead over Dave Trane. Newcomer Rob Morreale, meanwhile, has taken an eight-vote lead for the second available Town Board seat. The election results are not official, and the Democratic Party may contest 14 disqualified affidavits on behalf of Trane, who led Janese by 29 votes on Election Day. For more election numbers, click here. 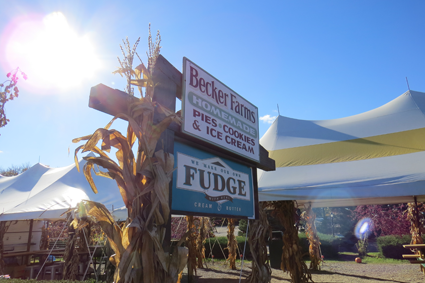 On a typical Friday at Becker Farms, one would be surprised to see lots going on around them. At first glance you might see people leaving with fresh-picked apples or pumpkins and little kids taking pictures by the haystacks and cornstalks. But look closer and you’ll see adults tasting Becker Farm’s own micro-brewed beer or hard cider, even the wine that is made from their own leftover fruit. In addition to that, one of the hundreds of weddings that are held there every year is being set up at one of the two venues they offer, and preparations are in order for the haunted hayride that will take place that night. And while all this is going on the aroma of fresh made cider donuts fill the air. For owners Oscar and Melinda Vizcarra, this is a normal Friday and it’s what they have been working on for the past 36 years. In 1979, they got married and began turning Becker Farms into the entrepreneurial empire it is today. “Every year we have listened to what our customers wanted,” Melinda said.